Battling low appraisals. In the past few months I’ve had agents call me from all over the country asking how we’re handling properties that sell for more than the appraisal. We’re tied into dozens of private Realtor discussion boards, Realtor networks, and organizations and this topic has been popping up frequently, so we thought we’d take a moment to help those in SW Florida with some tips we’ve learned over the years to combat this problem. Let’s identify the problem. Appraisers are looking in the past for data that supports today’s value, but the problem in a rising market is that the data in the past is lower by definition because prices have been rising. 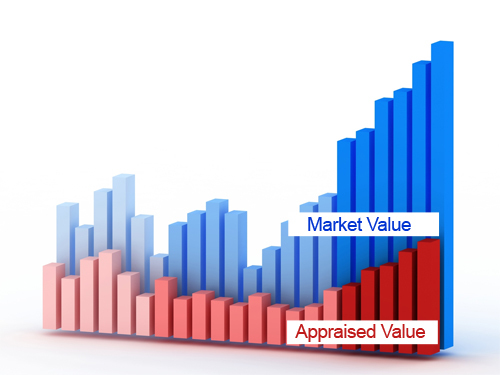 When a market is on the move appraisers can make a time value adjustment but it seems they’re quicker to make adjustments in a declining market than they are in a rising market. Once property goes pending make showings by appt only. When appraiser calls meet them out there with comparables you used to value the property. Appraisers have a difficult job. They’re underpaid and expected to turn these around within a day or two. If you have legitimate information that may help them it is usually welcomed. If you go in with an attitude and trying to persuade them to come in with a value just because you need a sale at a certain price it won’t work. Appraisers legitimately want to get it right; they just need facts that fall within accepted guidelines to backup the value they issue. If the loan was placed with a mortgage broker and not a direct lender and you feel the appraisal is bad, the mortgage broker can request an appraisal from a separate appraisal management company if the lender they’re brokering it to accepts from more than one management company. Since HVCC (Home Valuation Code of Conduct) went into effect May 1, 2009 lenders can no longer work directly with appraisers. This is why agents may only get one chance to talk to the appraiser at the time they inspect the home. FHA appraisals are good for 6 months, so once it’s completed you’re pretty much stuck with that value. You can dispute a FHA appraisal and provide documentation and it can be amended, but this is not guaranteed. If an out of town appraiser calls with an order to appraise the home, don’t let them in. Call the lender and tell them you want an in-town lender and to re-order with another appraiser. Over the years out of town appraisers unfamiliar with the local market have wrecked many deals. Remember one thing about the new HVCC. They have cut what they pay the appraisers and shortened the time the need results. When you call an appraisal management company to ask for business the typical question is what is your cheapest price and fastest turnaround. This isn’t always conducive to an appropriate value on the home. Perhaps one day somebody in authority will re-work this process as it can hold back the real estate market. Thank Goodness we have cash deals bolstering the market. If you’d like to search the MLS, visit our website at www.Topagent.com If you’re considering selling and would like the Ellis Team to show you what we think we can get for your home, go to www.SWFLHomevalues.com or call us at 239-489-4042 Good luck and Happy Selling! To search the MLS for properties go to www.TopAgent.com or give us a call at 239-489-4042 Good luck and Happy House Hunting!!! Posted in Cape Coral, Cape Coral Real Estate, Fort Myers, Fort Myers Real Estate, Southwest Florida Real Estate.Tagged Appraisal value, Appraised value, Battling Low Appraisals, HVCC, Low appraisals, Market value, Realtor values, SW Florida real estate market values.